Giant Sign has been in business over 30 years and it is still going strong! Blow Ciggystick.com, like this one, used an Illuminated Dual-Lit Channel Letters , in which we design the letters and put the letters up on the wall. Interested in starting a business, but you have no idea how to or where to inquire for a sign? Giant Sign is a place for you! Give us a call for free consultation at (972) 247 – 4404. Giant Sign has been in business over 30 years and it is still going strong! Your Choice Primary Care, like this one, used a lighted channel letters on Raceway , in which we design the letters and put the letters up on the wall. Interested in starting a business, but you have no idea how to or where to inquire for a sign? Giant Sign is a place for you! Give us a call for free consultation at (972) 247 – 4404. Giant Sign has been in business over 30 years and it is still going strong! Daiquiri Factory, like this one, used a lighted channel letters on Raceway , in which we design the letters and put the letters up on the wall. Interested in starting a business, but you have no idea how to or where to inquire for a sign? Giant Sign is a place for you! Give us a call for free consultation at (972) 247 – 4404. Giant Sign has been in business over 30 years and it is still going strong! Lopez Auto Insurnace, like this one, used a lighted channel letters on Raceway , in which we design the letters and put the letters up on the wall. Interested in starting a business, but you have no idea how to or where to inquire for a sign? Giant Sign is a place for you! Give us a call for free consultation at (972) 247 – 4404. Giant Sign has been in business over 30 years and it is still going strong! Boost Mobile, like this one, used a lighted channel letters on Raceway , in which we design the letters and put the letters up on the wall. Interested in starting a business, but you have no idea how to or where to inquire for a sign? Giant Sign is a place for you! Give us a call for free consultation at (972) 247 – 4404. Giant Sign has been in business over 30 years and it is still going strong! 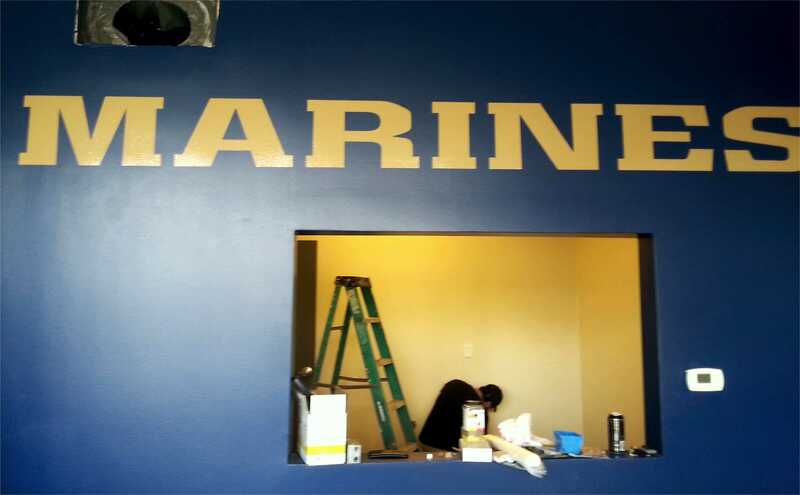 Marines Office, like this one, used a lighted cabinet box sign , in which we design the letters and put the letters up on the wall. Interested in starting a business, but you have no idea how to or where to inquire for a sign? Giant Sign is a place for you! Give us a call for free consultation at (972)-247-4404. Giant Sign has been in business over 30 years and it is still going strong! 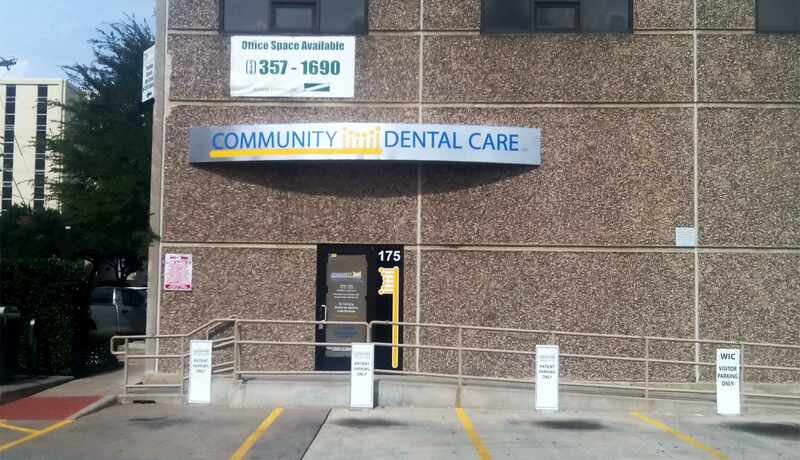 Community Dental Care, like this one, used non illuminated curved routed aluminum panel sign, in which we design the letters and put the letters up on the wall. Interested in starting a business, but you have no idea how to or where to inquire for a sign? Giant Sign is a place for you! Give us a call for free consultation at (972) 247 – 4404. Giant Sign has been in business over 30 years and it is still going strong! Wash & Dry, like this one, used a lighted channel letters on Raceway , in which we design the letters and put the letters up on the wall. Interested in starting a business, but you have no idea how to or where to inquire for a sign? Giant Sign is a place for you! Give us a call for free consultation at (972) 247 – 4404. Giant Sign has been in business over 30 years and it is still going strong! The Learning Extension, like this one, used a lighted channel letters on backplate , in which we design the letters and put the letters up on the wall. Interested in starting a business, but you have no idea how to or where to inquire for a sign? Giant Sign is a place for you! Give us a call for free consultation at (972)-247-4404. Giant Sign has been in business over 30 years and it is still going strong! All Heart Dental, like this one, used a lighted channel letters on backplate , in which we design the letters and put the letters up on the wall. Interested in starting a business, but you have no idea how to or where to inquire for a sign? Giant Sign is a place for you! Give us a call for free consultation at (972)-247-4404.